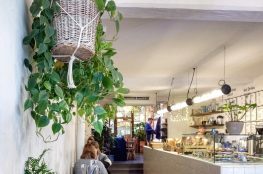 We enjoyed another amazing brunch of avocado toast, bright green vegetable laden risotto, juice and coffee at Judy’s. 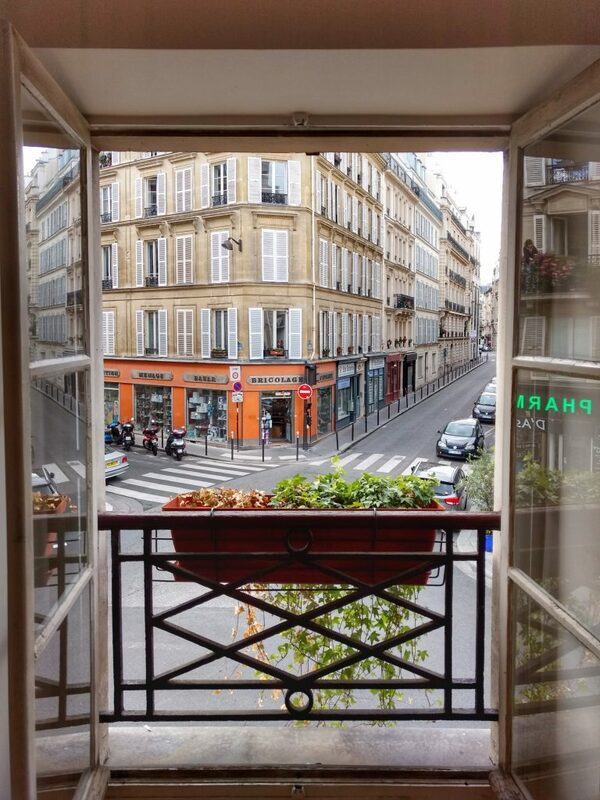 Sitting next to the window we watched the Sunday rhythm of the street, people walking dogs, families on their way to a day of fun, people sunning themselves on the terrace across the street. As we left the restaurant the Jardin du Luxembourg, or Luxembourg Gardens, beckoned from the end of rue de Fleurus. We’d planned to spend the afternoon at the Musee d’Orsay, but it was too beautiful a day to spend indoors. There were only a few clouds in the sky and it was warm enough not to wear a jacket in the sun. It’s a decision we’ll never regret. Sometimes you need to throw your itinerary out the window to have the time of your life. We’ll never forget our day in the Jardin du Luxembourg. As we entered the shaded path, we looked up into the bright green umbrella of light through the leaves while crushing the first fallen leaves of autumn. There were other couples strolling hand in hand and extended family groups trailing along. 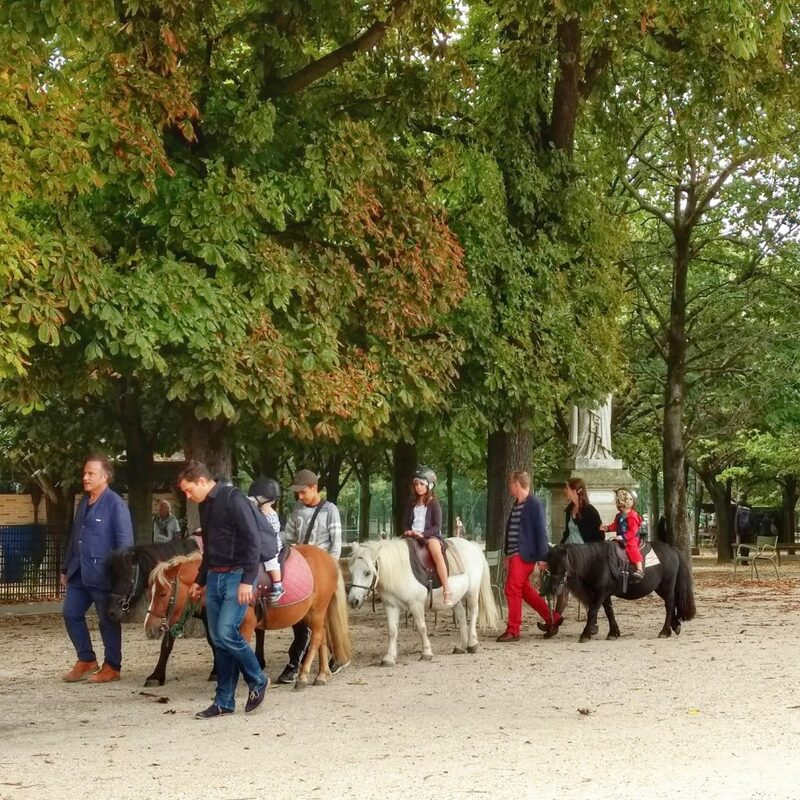 Short ponies with pot bellies carried little ones wearing helmets, each led on a leash by a parent. The cries of children from the playground beckoned. The puppet theater, an institution of the Jardin du Luxembourg since the 1930s, appeared closed or between shows. Even though it was a beautiful day, the merry-go-round, the oldest in Paris, was shut up tight. It was a pity, as I loved to watch the children’s delight, imagining all the generations of Parisians who’d ridden it since 1879. It reminded me of how much fun I had as a girl riding the 1915 merry-go-round in the old Edgewater Packing Company on Cannery Row in Monterey, California. With these attractions out of the equation, the playground was filled to capacity. We were pleased to notice, wherever we went in the park, parents and grandparents engaging with children. No one was glued to cell phones. The children didn’t have to wait for the mom or dad to look up and take notice. 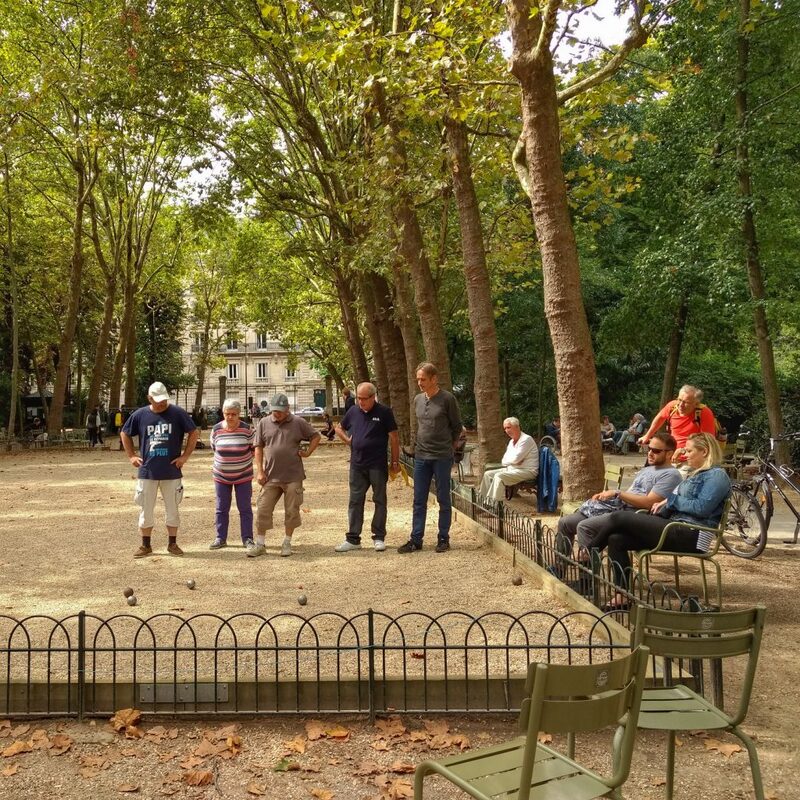 Hearing cheers and applause, we proceeded to the area where the gentlemen play pétanque. It’s a game similar to the Italian game of bocce, where balls are tossed or rolled at a smaller ball and the goal is to get as close as possible to the little one. Today the men seemed younger and there was a woman among them. A sign of changing times? They all gathered around and discussed the results of each turn and seemed to be enjoying themselves and the weather. Beyond them, we turned onto a shaded gravel path. 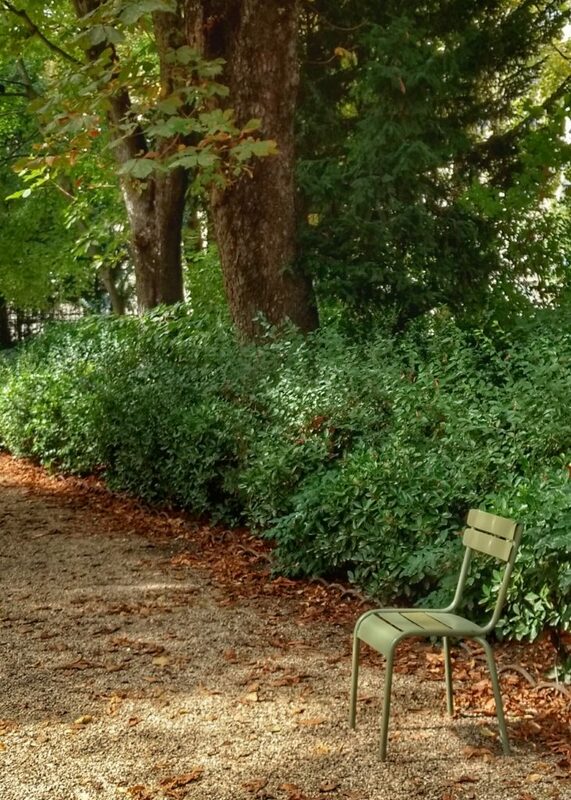 We came upon a single green aluminium chair, the kind ubiquitous to Parisian parks, toward the edge of the path. Loungers drag them about at will; sometimes using one to sit and another to rest tired feet and legs, other times they’re grouped for easy conversation, or pulled to the edge of an expanse of lawn one can admire but not tread upon. It’s unfathomable to Americans that these little treasures aren’t stolen, but the park police are on constant patrol, and the gates locked at sunset. This little lone chair caught my attention and imagination. 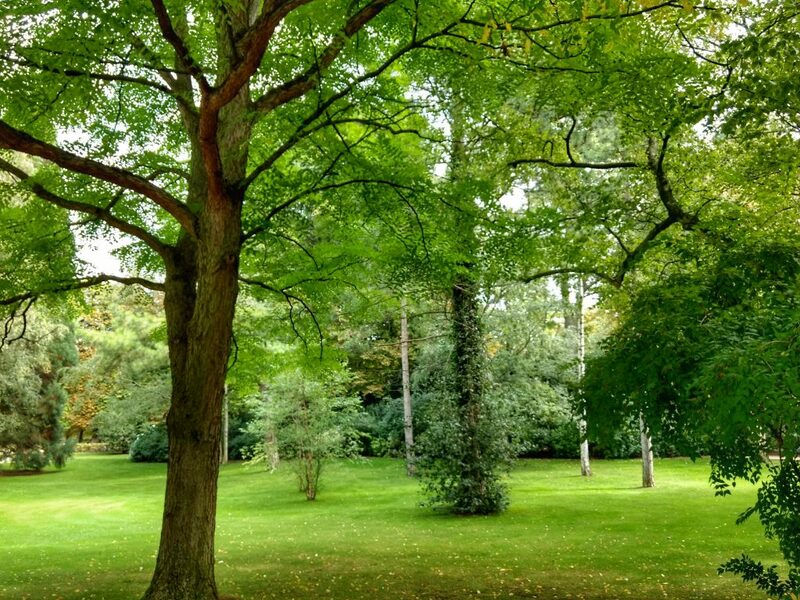 I snapped a photograph to remember it by: the dappled light, the shadows, the soft green of it contrasted with the darker bushes behind it, the bright leaves above, and the row of brown fallen leaves below. Was it left behind when others were moved? I prefer to think someone carried it this stretch of lane on purpose, to experience a bit of solitude with a good book. 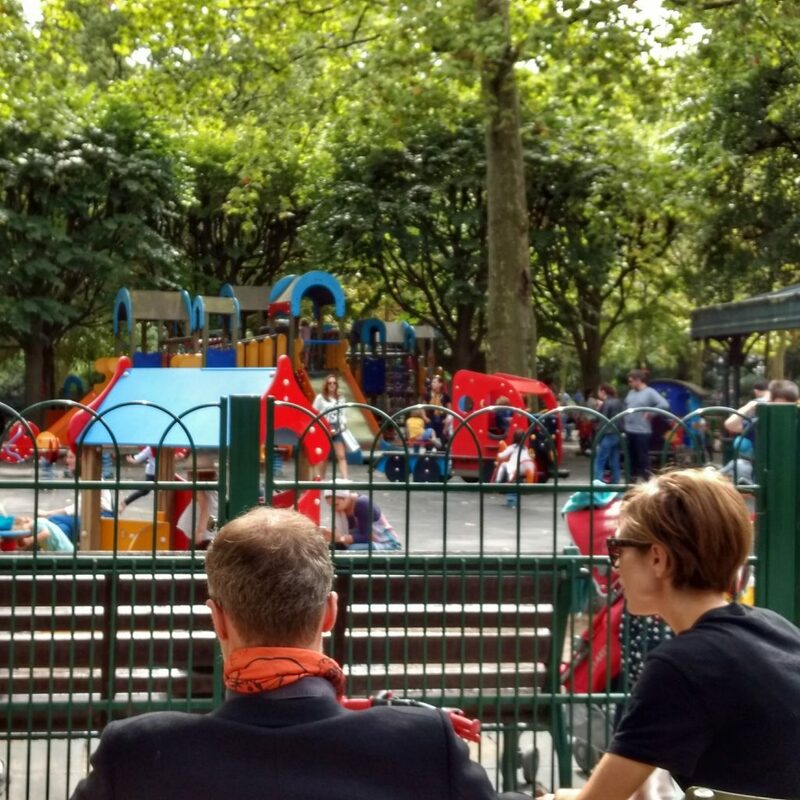 It’s still close enough to feel connected to life in the park: the sounds of children’s laughter from the playground, the clip clop of the pony hooves, the clicks of the pétanque balls and ensuing debates of the men after they fall all wind down the path. A bit further on were two groupings of four chairs. They looked as though their occupants had gotten up only moments earlier. I could still feel the energy of their inhabitants and, if I squinted, could still see them sitting there: talking and laughing, looking up through the trees at the sky for signs of rain, pushing a little stone around with the toe of a sneaker while considering an appropriate response, stealing glances at one another to gauge reactions, adjusting a jacket, looking at a watch, pulling a scarf out of a bag, gesturing with their hands, someone suggests a coffee, nods all around, and they head out to find one. 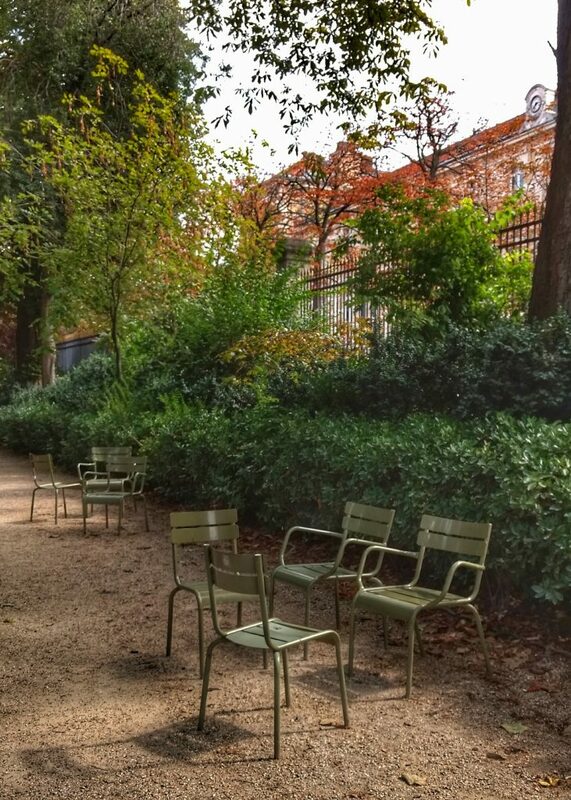 The chairs left to continue their ghost conversation. 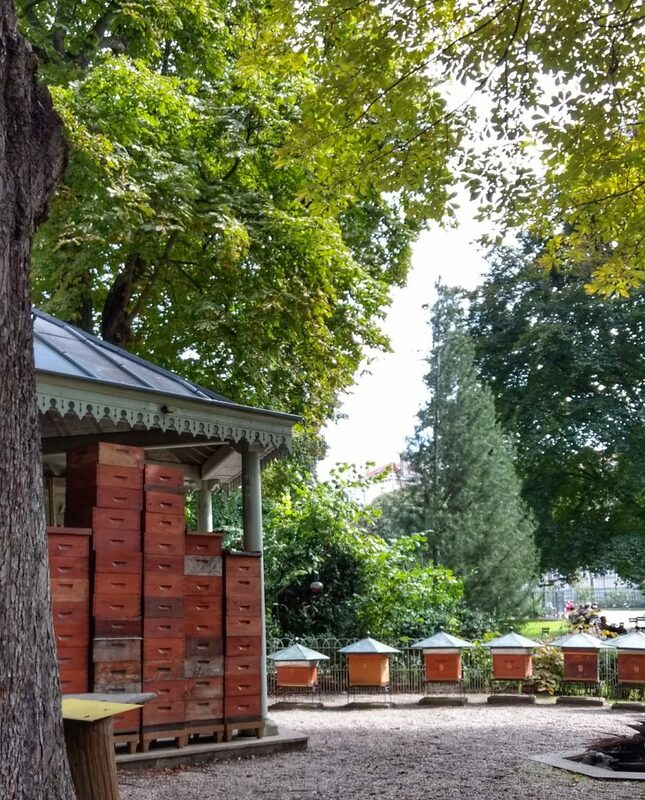 In the southwest corner we came to the Jardin du Luxembourg apiary. The little wooden houses for bees were a delightful find. 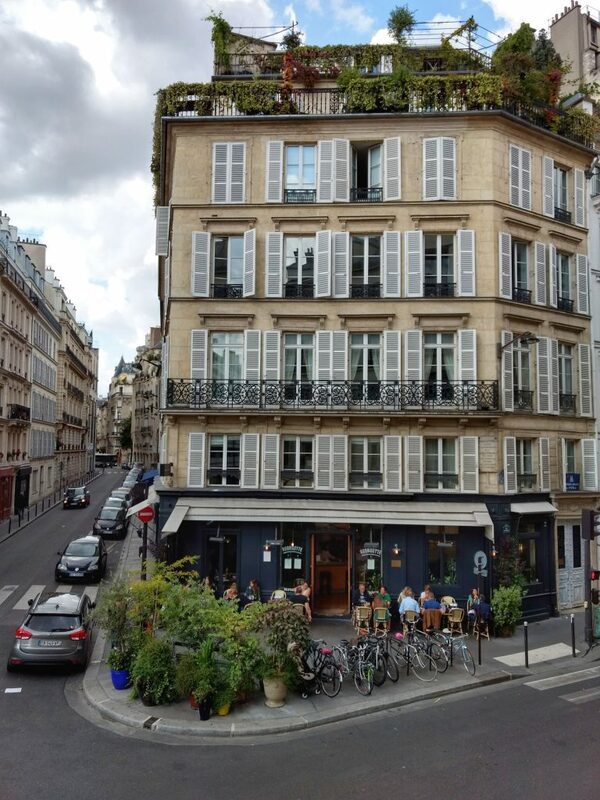 Besides its charm, I’d just read Cara Black’s mystery Murder in Saint-Germain and this was the location of the first murder. The murderer doused a woman who had a severe bee allergy with Orangina. The bees swarmed and attacked her, she died on the lonely path. I took several photographs to send to my mother, who was reading the book while we were away. One of my great pleasures of travel is connecting places to books and authors. 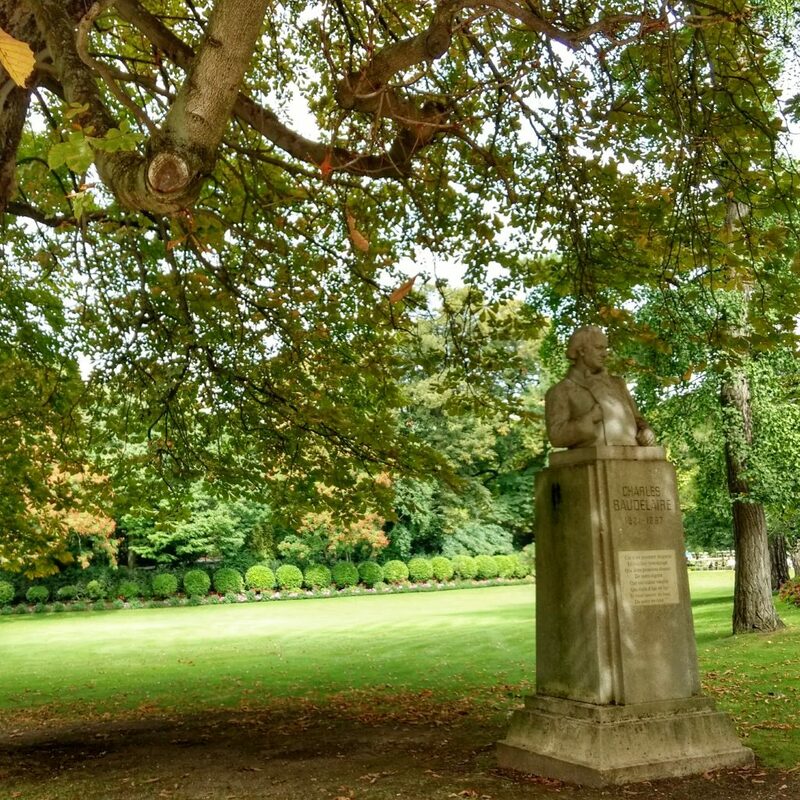 We then sauntered toward the Luxembourg Palace, admiring the great expanse of lush green “meadows,” for lack of a better term, dotted with trees and the occasional statue. Stone urns overflowed with fuchsia-colored petunias dotted atop the balustrade surrounding the lake. In November 2014 they held yellow and burnt orange chrysanthemums that seemed to glow against a deep gray sky. I love traveling to a city in different seasons, allowing it to unfold over the course of time. There is something special about getting to know its changes in light; yellow in warmer months and a white in cold, the angle of the shadows, whether it’s filtered through bright or dark green leaves, or branches stripped bare. In November there were only a handful of brave souls bundled up and strolling in the Luxembourg. It had started to sleet, and so we didn’t linger, and set off in search of coffee to warm up. I was happy to see it in winter, but longed to share its verdant abundance with Octavio some day. 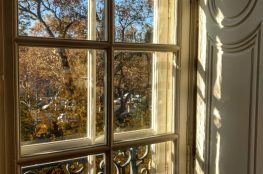 I had happy memories of savoring an almond croissant under the trees near the gazebo, listening to a distant musician; propping my weary feet up on a chair on a hot summer day and reading for a while to cool down. 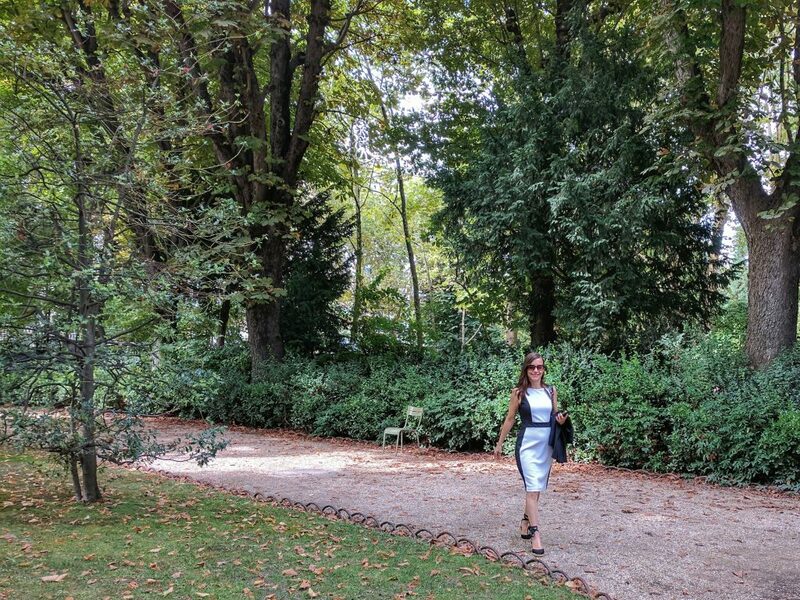 The Jardin du Luxembourg is a beautiful 60 acre park in the sixth arrondissement, boarding the fifth. Built in the early 17th century by Marie de Medici, the gardens have been open to the public since later that same century. The Luxembourg Palace, situated along the northern border, is where the French senate convenes. To the west, art exhibitions are held in the Musée du Luxembourg. 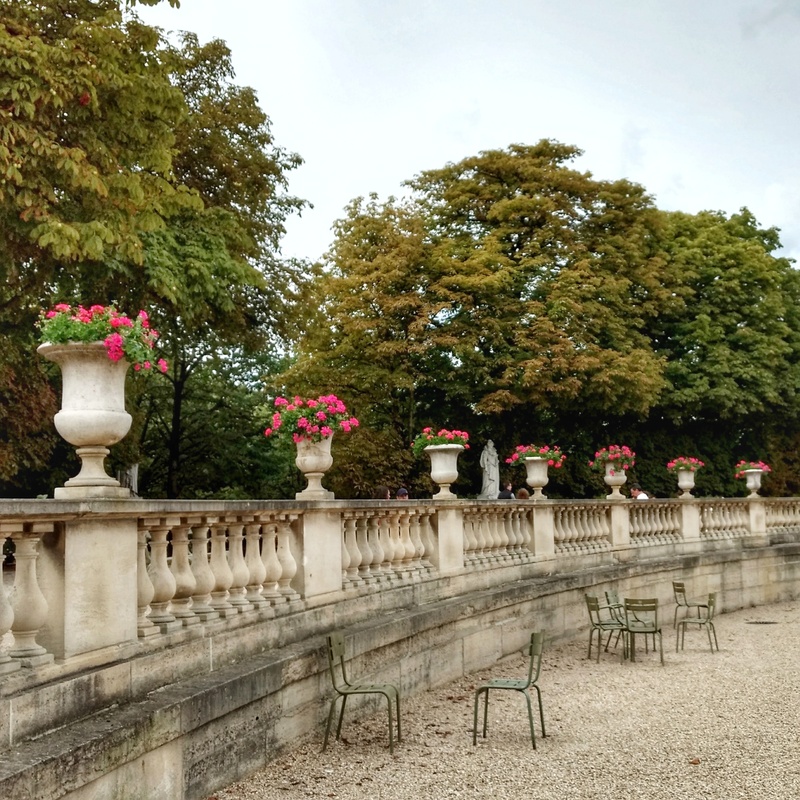 On Sundays especially, the Jardin du Luxembourg is filled with locals enjoying a day in nature, as city life does not afford most Parisians green space at home. The park is generally open from sun up to sun down; you will find practical information for planning your visit here, but I recommend keeping your itinerary loose and enjoying the day. In book seventeen of Cara Black’s Aimeé Leduc detective series Aimee must hunt for a Serbian war criminal thought to be dead. Is he alive or is she chasing a ghost? Each book of the series is set in a different neighborhood and offers a wonderfully vivid sense of its uniqueness within Paris. One of the reasons I enjoy this series is that the central theme of each mystery centers and elaborates upon a historical or social issue. 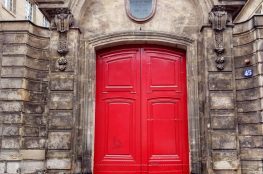 Note: This post contains an affiliate link to a book I’ve read and enjoyed.